Halloween greetings Rhinestone Beagle fans! 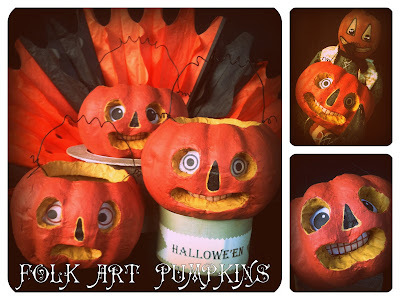 I'm Jenn ~ the crafter, baker and glitter shaker behind the creative nesting place, Rook No. 17 where I share my original recipes, vintage inspired crafts and cake decorating tips and tutorials. 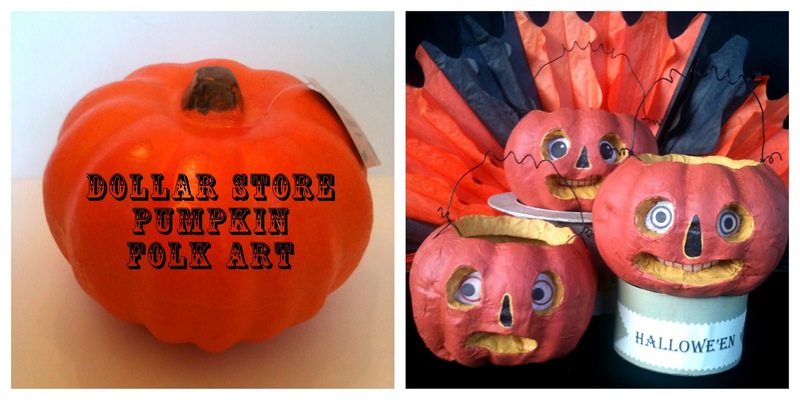 I'm thrilled to be a part of the Howl-o-ween festivities here at the RB! I LOVE decorating for Halloween and look forward, all year, to opening up my boxes full of Halloween folk art pieces. I'm a big fan of antique German papier mache and the contemporary works of Nicol Sayre and Dee Foust. Drawing my inspiration from those whimsical, collectible pieces from both past and present, I've come up with an easy and very inexpensive tutorial for making pumpkin primitives at home. DecoArt Americana Acrylic Paint in "Asphaltum"
Step 2: Using the printed eyes/mouth as templates, trace facial features with a sharpie on to the pumpkin. 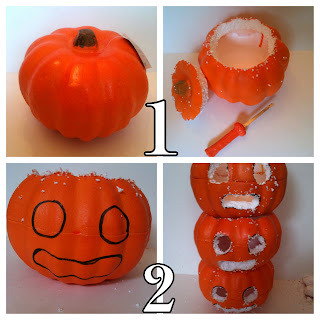 Using the serrated knife, cut out the eyes and mouth. Gently brush off the bits of stray foam. 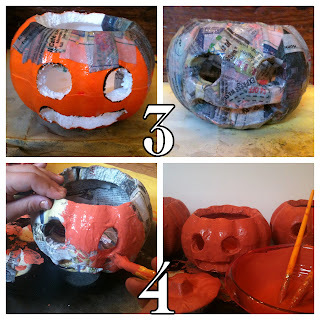 Step 3: Apply a layer of paper mache to the pumpkin, inside and out, by dipping a strip of newspaper in to the paste (recipe below), and slightly overlapping the previous piece on the pumpkin. When piece has been entirely covered, transfer to a 200 degree (F) oven and allow to dry for 1 hour. Whisk together flour and 2 cups cold water in a medium bowl. Add this mixture to a saucepan of 2 cups boiling water, gently whisking, and bring to a boil again. Remove from heat and stir in the sugar. Let it cool. Paste will thicken as it cools. When it does, it's ready to use. Step 4: Mix a combination of orange, brown and yellow acrylic paints to achieve the desired vintage orange color. 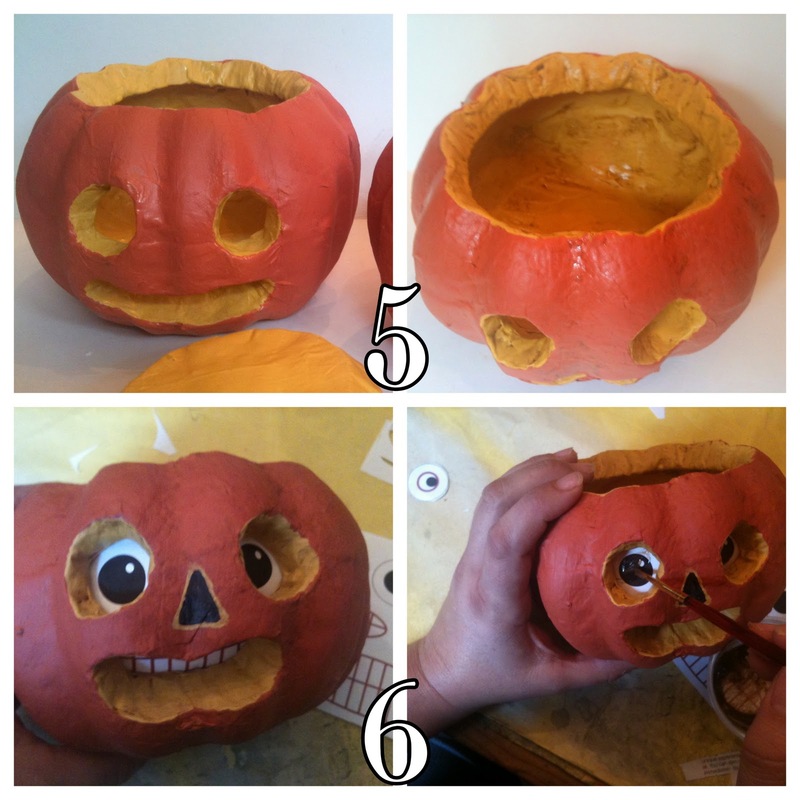 Paint entire pumpkin, both inside and out. Painting the inside orange will help give depth to the finished piece. Dry for 1 hour. Step 5: Mix paints to achieve a vintage yellow color. Paint the inside of the pumpkin, and the inside of the eyes and mouth with the yellow. For the nose, first paint a yellow triangle. Allow time to dry, then paint a smaller black triangle inside with acrylic paint. Allow piece to dry completely. 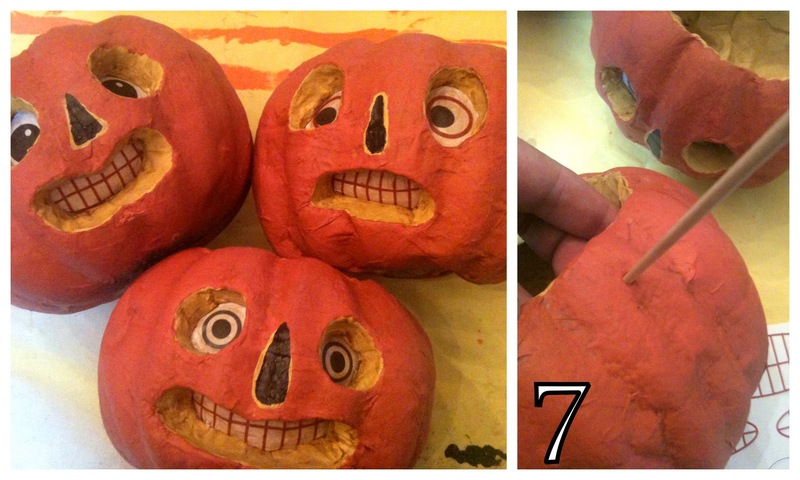 Step 6: Apply tacky glue around the edges of the eyes and mouth and glue in to place inside the pumpkin. Create a stain by combining the staining medium and a small amount of "Asphaltum" colored acrylic paint (or other antique brown color). 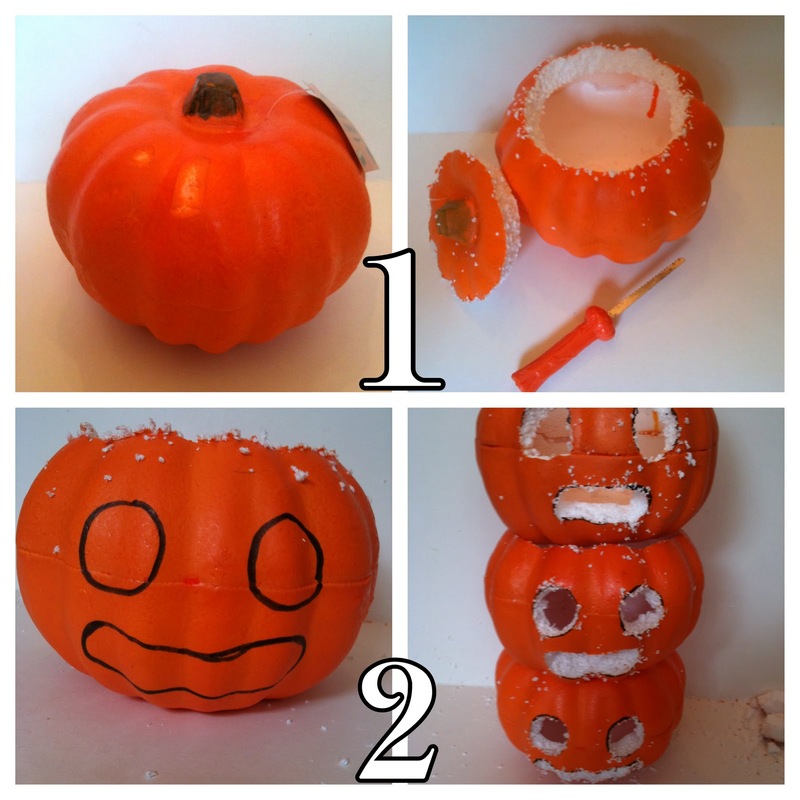 Brush the stain over the entire piece, inside, outside, and over the paper eyes and mouth. 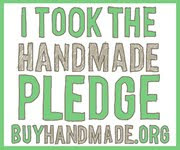 Use a paper towel to rub away any excess, and to achieve the desired level of antiquing. Allow piece to dry completely. 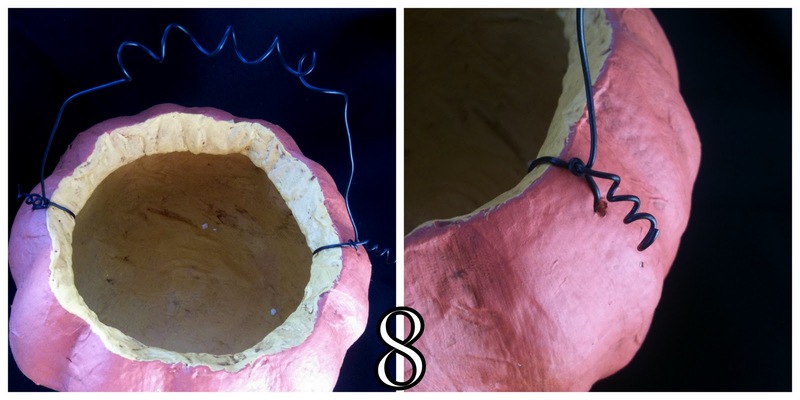 Step 7: Use an awl or bamboo skewer to punch a hole on opposite sides of the pumpkin, near the rim, for the wire handle. Step 8: Thread a piece of black wire (approx. 12-14" long) through one side (from the outside). Bring it through and back up, and twist to fasten to the larger piece, leaving an inch of excess. Repeat with the remaining side. Use a pencil to create a corkscrew with the excess pieces on either side. 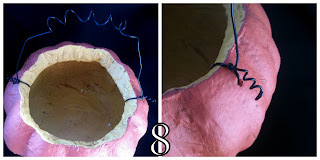 You can also wrap the arch of the wire handle around the pencil to give it a corkscrew in the middle. 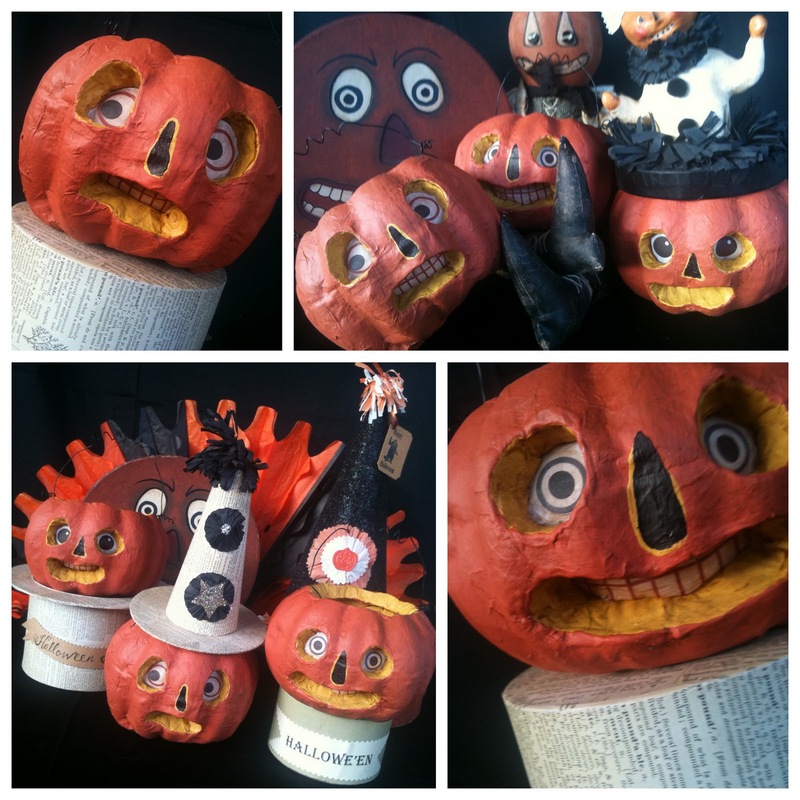 Just look at that goofy jack-o-lantern grin! There's something lovably quirky about these guys. It's my pup Pancho -- all dressed up as a wingless bat! He must have used echolocation to find me. how unique and cute! Love it!